Its been a busy start to 2017 in our Brokerage with lots of high quality cruising yachts finding new homes around the globe. With favourable exchange rates against the pound we have been working with an international clientele during the later part of 2016 and early part of 2017 as Euro and Dollar based buyers swoop in to grab some great boats at very favourable prices. During the last 6 months we have found new homes for Najad's, Finngulf's and most recently the Rustler 36 'Cayambe' in Europe and the Americas. After just 6 weeks over the festive period listed on our Brokerage and interest from several different parties we concluded the sale of the Rustler 36 'Cayambe' to Mr. Willaert from Belgium. During the spring our workshops worked through Mr. Willaerts list of required works, upgrading some of the onboard electronics and undertaking works on the engine and sterngear to make her ready for her North Sea shakedown. Having now completed the delivery trip Mr. Willaert provided a summary of his experiences buying a boat through the Ardfern Yacht Centre Brokerage service. 'We sailed off from Ardfern with fair weather and took all the daunting (so I had read in many a pilot books) obstacles without problems. We thought to spin around in the Dorus Mor, to shipwreck in a sucking Corryvreckan and to be smashed in pieces in the Fladda Narrows. Although I respect highly this tough waters I was greatful we could pass through with peace. 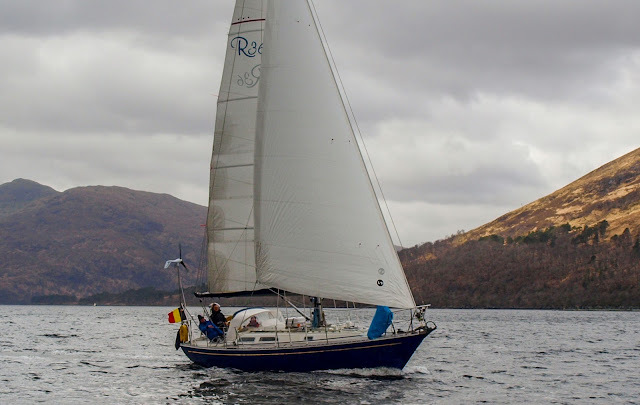 The other day the very sympathetic Scottish weathergods gave us a good westerly breeze to sail from Oban up Loch Linnhe to Corpach where we had immediate acces to the Caledonian Canal. On our approach to Fort William we encountered only one sailboat, another Rustler 36 from Ardfern, Pickle. The passage of the Caledonian Canal was a true delight. All alone in the middle of this impressive landscape. A unique experience for the nature lovers we are. 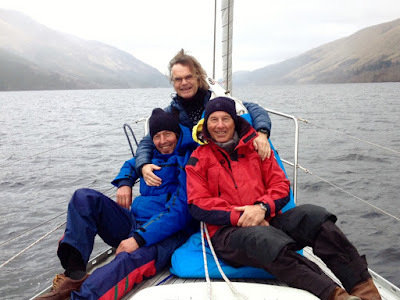 Chased by energetic weather forecasts at the east coast we flew over the Lochs to Inverness to get asap on the track south before the april gales could catch us. It was with a mixture of astonishment and sadness we saw the beautiful coastline passing by. We crossed the Firth of Forth with forty knots northwesterly winds on a sturdy eight ton long keeler with speeds up to ten knots. (three reefs and a staysail) I never expected a Rustler 36 to surf. We made one overnight stop in Hartlepool to stretch the legs. (the pub was a three minute walk) After nine adventurous days of true maritime delight we saw the concrete Belgian coastline appear at the horizon. I wish to thank all the people at Ardfern Yacht Centre who prepared 'Fair Isle' (former SY Cayambe) in a way I could cross oceans with her. I don't know all of them by name but I'm convinced they all execute their job with passion. Special thanks to the engine strippers, the riggers, Andy, the electronic magician and of course to Mr. Cameron with whom it's a pleasure to do business. While its always sad to see a boat like 'Cayambe'; been based in Ardfern since she was launched, leave Scottish waters we are sure she is in good hands in her new cruising grounds under her new name 'Fair Isle'. Hopefully Mr. Willaert enjoys fair winds for his first season. We have a list of buyers looking for well presented cruising boats. If your thinking about changing you boat why not give Mark a call and discuss your requirements, see the latest listings on our new Brokerage Webpage. Thanks for publishing my short report of our 'North Sea Shakedown' journey. In july my Rustler 36 points it's bow north again for a cruise to the isle where she got her name from, beautiful Fair Isle. Still remembering my stay at Ardfern as a highlight in my sailing life. One day I will sail back to Cayambe's home waters.